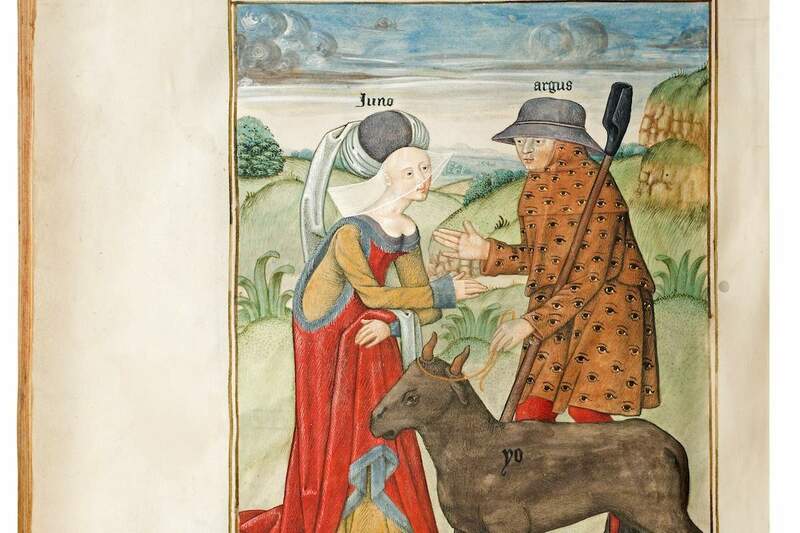 In the first of two miniatures added to the codex made for Raphael de Mercatellis (d. 1508) in Bruges, the elegantly dressed Juno bends over to instruct Argus, who holds the heifer next to him, tied with a rope. All three figures are depicted in a landscape with some broad-leaved plants, and are identified by name. 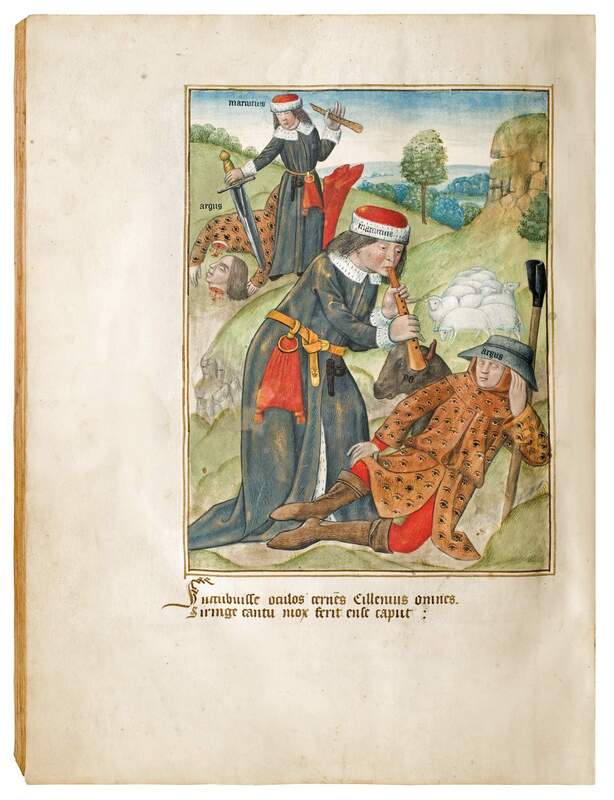 The second full-page illustration shows two scenes in one: in the foreground, Mercury, who leans protectively on Yo, puts Argus' eyes to sleep by playing his flute. In the background, we see that Mercury has decapitated Argus. Their names are inscribed as: Yo, Marcurius, and Argus. Mercury's music makes Argus' 100 eyes fall asleep - a lapse for which he pays with his life. As painted for Raphael de Mercatellis in Bruges, c. 1500. Stephen Fry is said to show us that the Greek (and Roman) Gods “are like the best and worst of us, they tell us who we are”. Indeed, Fry's retellings give a contemporary resonance that will be appealing to many. As the Penguin advertisers say “No one loves and quarrels, desires and deceives as boldly and brilliantly as Greek gods and goddesses. They are like us, only more so - their actions and adventures scrawled across the heavens above.” Not surprisingly Fry’s book is a big success and has found readers of all ages. The heritage of Antiquity was no less “smart, funny, and above all great fun", in Mercatellis' time as it remains today! For Raphael de Mercatellis, one of 26 or more illegitimate children that the Duke of Burgundy fathered, these stories may not have had only educational value. Perhaps the adventures of Jupiter and his extra-marital children also carried a personal touch. Is the spirit of these representations connected to the psychology of the patron?